A lot of times, you really need very little to make a decent movie. Tangerine is a type of film that has even less than very little when it comes to the cinematic gear, sets, and props, but it has more than enough in the terms of actors and performances. Following two transgender prostitutes and an Armenian taxi driver on the streets of LA on Christmas eve, it explores the nature of relationships in a place where desire and utter loneliness go so well together. As Sin-Dee works tirelessly on finding her pimp/boyfriend, her friend Alexandra tries to provide her with some common sense while she calls on mutual acquaintances to visit her gig taking place on the same evening. As they go about their business, the city remains indifferent to their hopes, fears, and aspirations. But, in spite of this, the film, just like Dope, manages to be an homage to LA, even when it comes to the parts that are not on the tourist maps. In a matter of several hours, the two converge, diverge and converge again, trying to stay afloat and stay happy in a world of Los Angeles that is only seen in gangster films that feature drive-by shootings. The film�s director Sean Baker created this comedy drama on less than a shoestring budget. With the absolute minimum of investment, he still managed to pull off some impressive cinematography, accompanied by a perfectly crafted electronic soundtrack. Here, Sin-Dee and Alexandra work the streets and at the same time, their counterpoint in the form of Razmik, the taxi driver who apparently has all figured out, but is also cursing the same streets looking for compassion and love. In Tangerine, Kitana Kiki Rodriguez, Mya Taylor, and Karren Karagulian perform brilliantly, precisely measuring their acting to suit every situation just right. At a first glance, a film like Tangerine might appear all flash and no bang, but the first 15 minutes are enough to put an end to that theory. Additionally, Baker managed to infuse it with the right amount of humor, making it in equal measure a dark comedy and an optimistic drama movie. But, it�s this optimism that really pushes the film even when there apparently is not much to be hopeful about. 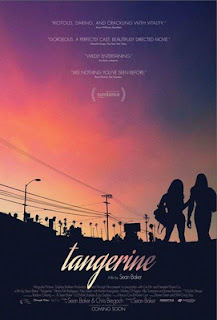 Thanks to it, Tangerine remains upbeat and full of energy even in its dark moments, saying a lot about life in general.